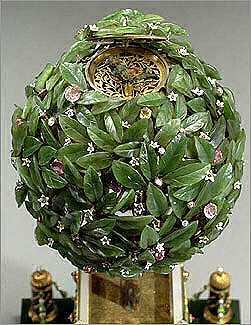 The 1911 Bay Tree Egg, also known as Orange Tree Egg, is made of gold, green and white enamel, nephrite, diamonds, rubies, amethysts, citrines, pearls and white onyx. 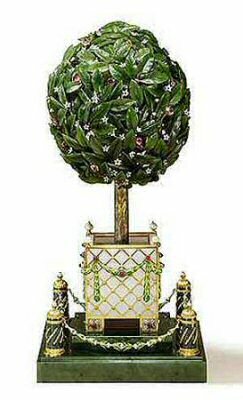 The topiary tree formed as a profusion of carved nephrite, finely veined leaves and jeweled fruit and flowers on an intricate framework of branches, the fruit formed by champagne diamonds, amethysts, pale rubies and citrines, the flowers enameled white and set with diamonds, a keyhole and a tiny lever, hidden among the leaves, when activated open the hinged circular top of the tree and a feathered songbird rises, flaps its wings, turns its head, opens its beak and sings. 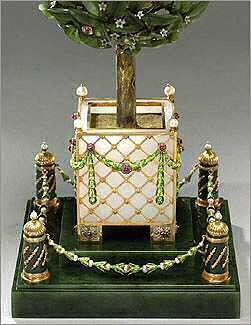 The gold trunk chased to imitate bark and planted in gold soil is contained in a white quartz tub applied with a gold trellis chased with flowerheads at the intersections and further applied with swags of berried laurel enameled translucent green and pinned by cabochon rubies, the central rubies edged by diamonds, each foot of the tub also applied with chased gold rosettes set with cabochon rubies and diamonds, the corners of the tub with pearl finials, the square carved nephrite base in two steps with a miniature nephrite fluted column at each corner set with chased gold mounts, each column with a gold cap surmounted by a pearl nestled in translucent green enamel leaves, the swinging gold chains between the columns formed as pearl flowers with translucent green enamel leaves, inscribed Fabergé in Cyrillic with the date 1911 on lower front rail of the tub. 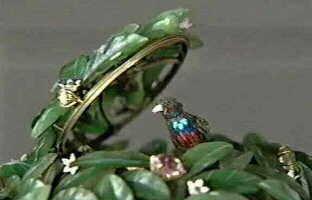 First known in 1935 as a Bay Tree Egg, this egg which had since 1947 been incorrectly labeled as an Orange Tree, was given by Tsar Nicholas to his mother the Dowager Empress on April 12, 1911. The Egg was confiscated by the Provisional Government in 1917 and transferred from the Anchikov Palace to the Kremlin. It was one of nine eggs sold by Antikvariat to Emanuel Snowman of Wartski around 1927. It has since passed through the hands of five different owners and was sold by Mrs .Mildred Kaplan to Malcolm Forbes in 1965. 2004 sold by the Forbes' family to the Vekselberg Foundation/The Link of Times Foundation, Russia.